Pappa Aap is located at Calaislaan 1 in Woensel-Noord in Eindhoven. 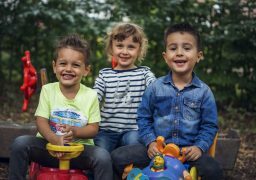 We offer all forms of childcare at this location: day care, toddler care and out-of-school care. There is plenty of fun here for all kids, young and old. 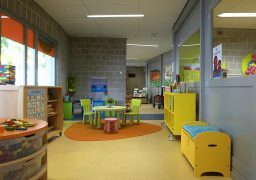 Children enjoy themselves in the discovery corner, the home corner, the kitchen, the building corner, the shop or the read and relax corner. There are also different cabinets with various playing materials that children can grab themselves. For the youngest ones, there is a closed outdoor area, and for toddlers and out-of-schoolers, the square is the place to be. 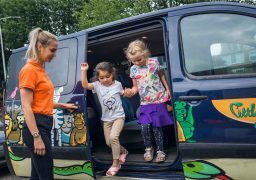 Little Jungle childcare collects children from nearby schools. Click here for the overview. An organised activity, or playing freely at the child centre? There is lots of room for the childrens’ own initiative. Our pedagogical staff always think of fun and challenging play activities, which children love to participate in. And if they don’t feel like it? Then they can think of their own activity, there are plenty of materials. This way, a day at Pappa Aap is a fun day for everyone! Call 040–237 5761 for a tour or send us an e-mail. Want to know what the costs are for your child(ren)’s care? Then use our calculation tool to calculate the net costs for your situation. Click here to easily calculate what your net costs will be, including the costs for bringing and collecting the children to and from school.